Informal weddings are on the rise as more and more couples opt for a relaxed approach to their big day. 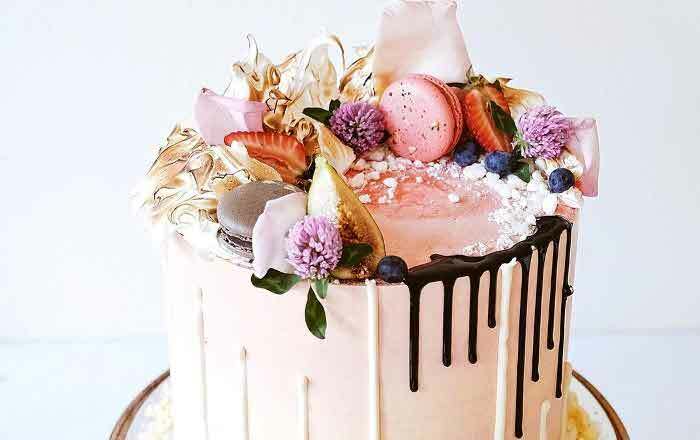 Defying conventions with non-traditional ideas for a celebration, weddings are becoming a more personalised affair with elements that reflect the taste and style of the happy couple. Commit to a casual occasion with these ideas to get the party started in an understated way. If you’re a couple who wants to celebrate the digital age, an e-invite is a less formal way of notifying your guests about the details of your day. 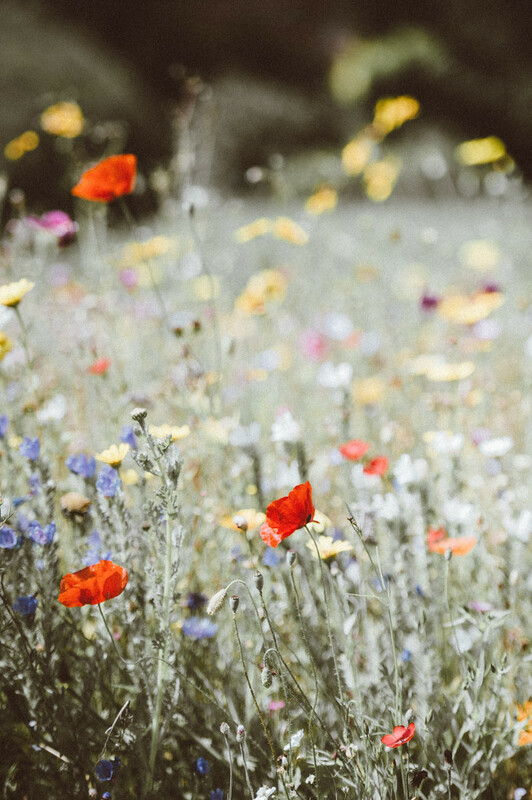 A family member’s garden or the local town hall can be dressed up to make your reception just as special as a grand and luxurious wedding venue. Taco parties are increasing in popularity as they are easy to set up and add an element of fun to proceedings by inviting guests to make their own food. How about extending the Mexican theme and accompanying guests' tacos with Tequila shots? You don’t have to go OTT to make a sensational statement with your wedding dress; here are some alternatives. Or you could even forgo the dress altogether for a trouser suit or bridal jumpsuit. Team with sandals, Converse, Doc Martins... or whatever you feel comfortable in. 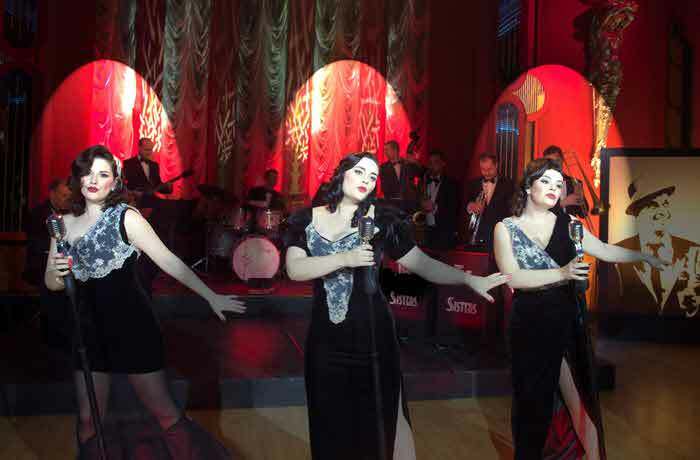 Instead of formally dressed waiters serving your guests drinks, why not opt for a more laid back service? Prosecco stations and wheelbarrow coolers are both casual and creative. You can even make your ice extra pretty by freezing colourful flower petals. 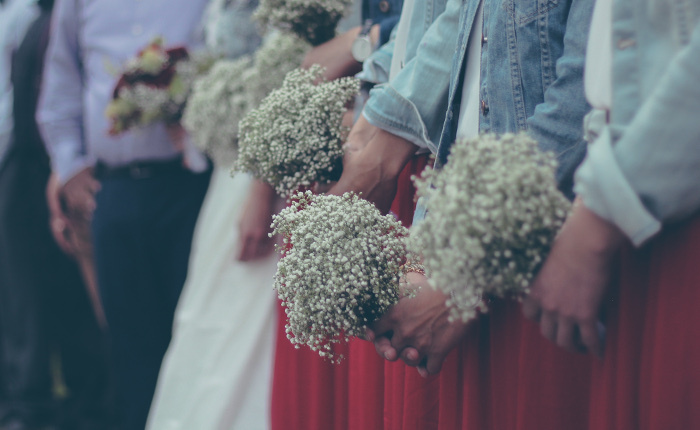 Your bridesmaids don’t have to look like clones. Instead, allow them to choose a dress that flatters their shape, size and style – setting a rule to ensure they don’t clash, such as ‘pastels only’. For a snack idea that gets all your guests involved, a s’mores bar is just the ticket. A traditional evening campfire treat, a s’more comprises a fire-roasted marshmallow and layer of chocolate sandwiched between two biscuits. You can set up a s’mores bar quickly and easily, provided you have all the components. The perfect pairing for a marquee fire pit... campfire songs optional. Different options for the wedding breakfast are vast, but picnic hampers filled with home-baked quiches, hearty pies, fresh breads and fruit chutneys are easy to prepare in advance. 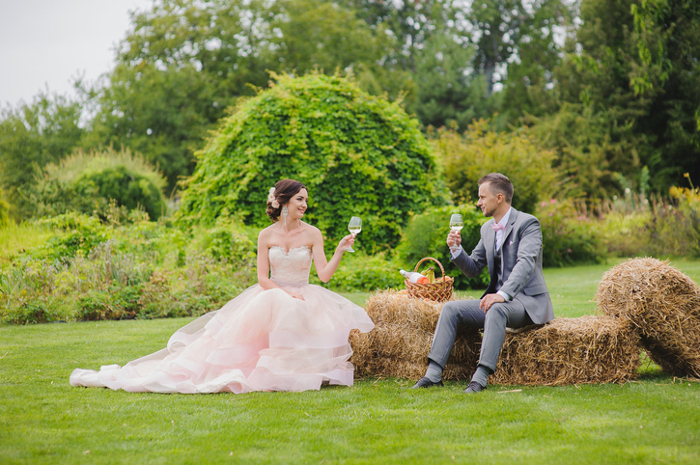 Perfect for an outdoor wedding, hay bales complete with bright cushions and blankets instead of formal chairs featuring traditional chair covers and décor, are a quirky way of gathering your guests for the ceremony. If you want to offer your guests more than one option of cake, why not create a dessert table that everyone can help themselves to? By including a mix of sweet and savoury dessert options, you’ll be pleasing all in attendance. While plastic cutlery and crockery is less desirable, wooden tableware can add a rustic charm without draining the budget. Decorate with coloured string, parcel tags and sprigs of greenery. 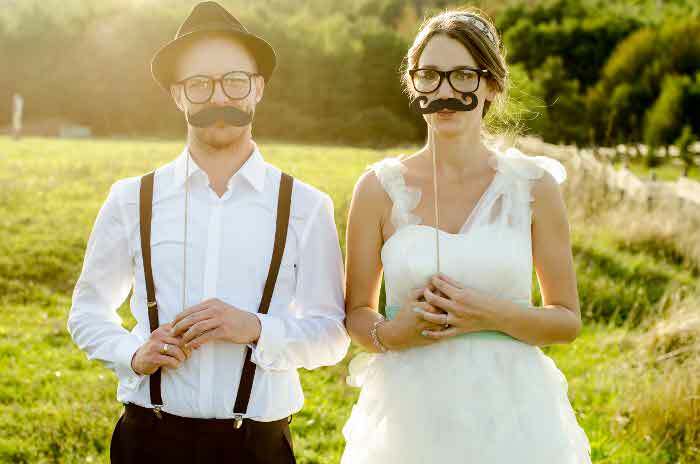 To promote a relaxed vibe, give your guests an idea of the dress code. Shirts and trousers for the men with no ties or suit jackets, and colourful tea dresses for the ladies, will instantly set the tone for the day. 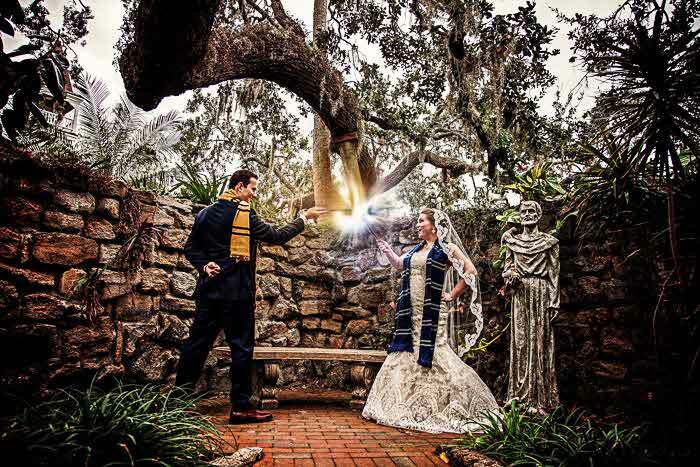 Even fancy dress can be welcomed, depending on the theme for the day - such as this Harry Potter wedding. Inject personality into your orders of service by presenting all the necessities in a humorous way. Empty wine bottles filled with fairy lights, a hand-drawn table plan, or reams of bunting spent hours agonising over, will all add a personal touch to your special day. Bouquets of shasta daisies, bunches of gypsophila and sprigs of lavender can look just as stunning as perfectly structured supersize arrangements. Less is more when it comes to informal weddings, so speak to your florist for their expert advice. Encourage fun and frivolity with garden games at a summer wedding. Croquet, beer pong or team games – such as a rounders match, will instantly break the ice and put guests at ease. Here are some ideas. I have been inspired by these ideas. I will be sharing this with some of my clients. I would also like to remind your readers to remember your power supply if you are having an outdoor wedding. https://www.generatorhire.uk.com/ You will be surprised at how many people remember power supply at the eleventh hour.